Easymodelling is a fully integrated Talent and Modelling Management system which runs all aspects of your agency's day to day operations. Easymodelling includes Booking, Invoicing, Imaging, Packages and many more features including integrating with social media websites like Facebook, Twitter, etc...Embed our Imaging solution directly onto your own website to reach out to your clients. As a fully web-based solution, it works from anywhere and on any operating system and devices. Easymodelling is an all-in-one system, built on proven technologies and combines every tool you will need for your operations. Easymodelling offers countless customizable options and settings. Contact us at info@easymodelling.com for a demo. Reach out to your clients by integrating Easymodelling's Imaging solution onto your agency's personal website or Facebook page. Our Imaging engine allows you to preserve in one and only location your Models'/Talents' updated portfolios which then replicates throughout all your media communication tools. Firstly, Easymodelling allows you to create as many portfolios for your Models'/Talents as you deem necessary to promote him/her. - a simple Image from their archive. 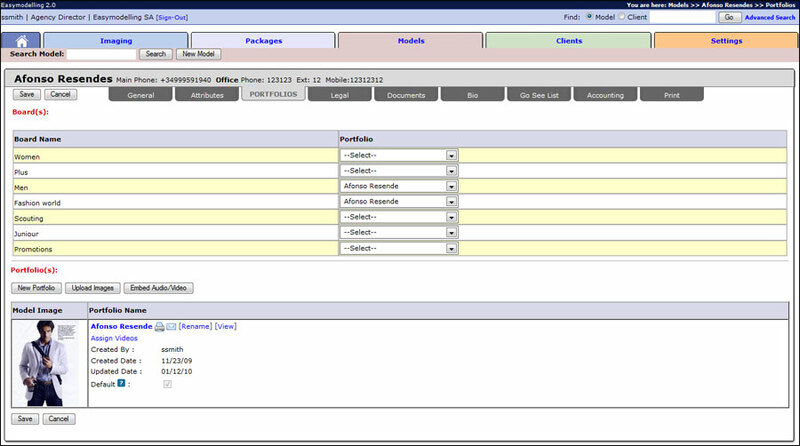 Our Client Relationship Management module allows you to create and maintain your client database with their respective contacts. Integrates with Skype and contains many other useful features to make your Easymodelling experience a unique one. Easymodelling's Talents database offers numerous features to manage and efficiently promote them. Quickly identify your in-town Talents vs. out-of-town. Create as many addresses to locate him/her while he/she travels the world for jobs, shows or shootings. Search a Talent based on particular attributes or availability . Easymodelling allows you to create users, to define access rights and track user activity. In addition, the application comes with a set of customizable options so as to make your Easymodelling experience an unforgettable one. "Easymodelling - The complete model agency management solution."